With dropshot fishing on light tackle becoming an increasingly popular tactic, especially among urban anglers, it's the perfect time to buy the Garbolino Sprint Lure Dropshot Rod , so that you can take advantage of this exciting discipline for yourself. 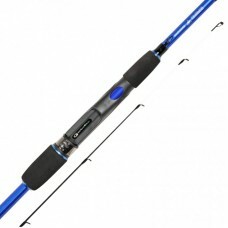 Coming in at 2.3m, with a casting weight of 0.5-10g, the Sprint is an ultralight lure rod that's great for short, fast sessions targeting small silverfish, and enjoying the thrill of harder takes from perch on lighter tackle – something you can never fully appreciate until you've experienced it for yourself. A two section rod that's designed for easy transport, the Garbolino Sprint lure rod is right up to date, and ready for action. A new addition to our range of reels is the new Garbolino Blitz. Front drag with Infinite anti-rever..
A good solid reel at a great price. Although labelled a feeder and match reel, this is also su..